The Marion County Conference on Re-entry is an annual event sponsored by the city of Indianapolis and the Marion County Re-entry Coalition (MCRC). The purpose of the conference is to provide resources to community-based and faith-based service providers and to criminal justice agencies that serve the needs of ex-offenders re-entering the community. Marti MacGibbon delivered a presentation in a breakout session attended by a full capacity audience. 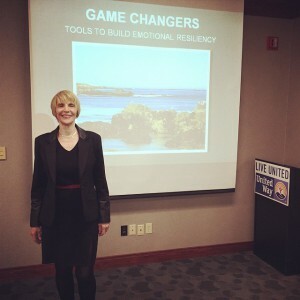 The presentation, entitled Game Changers: Tools to Build Emotional Resiliency, is a fun and interactive session that provides attendees with simple and effective strategies that anyone can employ to lift mood, adjust attitude, avoid burnout, stay flexible to meet challenges, and more. The tools are based in cognitive behavioral therapy (CBT) and mindfulness meditation, but Marti puts her high-energy spin on the class, and provides plenty of humor. Marti MacGibbon is a well-known humorous inspirational speaker and nationally award-winning author who has recovered from and triumphed over hard-core drug addiction, human trafficking, domestic violence, PTSD, homelessness and adolescent sexual assault/abuse. She signed copies of her funny and dramatic memoir, Never Give in to Fear: Laughing All the Way Up from Rock Bottom.